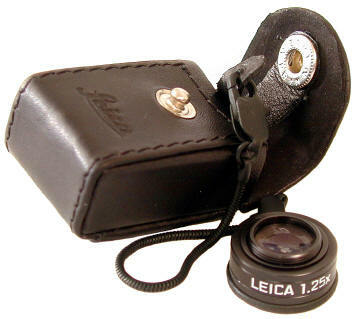 What took Leica so long? With the Leica M3 introduced almost a half a century ago in 1954, most experienced M shooters believed just about every useful M accessory had already been invented. Not true. 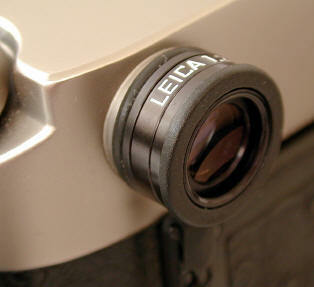 In 2001 Leica introduced the fabulous and amazing 1.25x Eyepiece Magnifier. What does it do? It gives you wonderful versatility by turning your .58 finder into a .72, your .72 into a .9, or a .85 into a 1.06 ! The magnifier simply screws into the Leica M eyepiece, magnifying the image AND the effective rangefinder baselength by 1.25x. On the left it is mounted on a M6, on the right a M2. 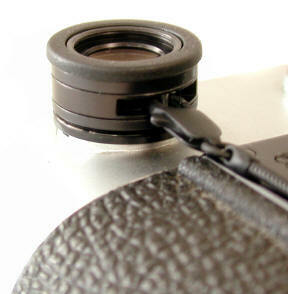 The 1.25x magnifier measures 9mm thick by 18mm diameter, and extends 7mm from camera body. Leica must have been surprised by its success. It is in short supply, and often sells for more than list price to eager Leica M photogs who are tired of trying to find one ! If you own a Leica M rangefinder, do yourself a favor: BUY IT ! Revised: November 25, 2003 . Copyright © 2002 Stephen Gandy. All rights reserved. This means you may NOT copy and re-use the text or the pictures in ANY other internet or printed publication of ANY kind. Information in this document is subject to change without notice. Other products and companies referred to herein are trademarks or registered trademarks of their respective companies or mark holders.